The next-generation Angénieux Optimo Ultra 12x is a high-end, multi-format zoom with interchangeable modules to cover sensor sizes from Full Frame 24×36 and RED 8K VV to U35 and S35. It is the venerable Optimo 24-290 reference redefined, the zoom lens that accompanied almost every major motion picture production since it was introduced in September 2001. Download the FDTimes PDF Report. Now, sixteen years later, the new Optimo Ultra 12x Zoom refreshes the industry benchmark with a completely new design, even better optics and more rugged mechanics. The classic Angénieux cinematic look continues with smooth skin tones and a pleasing balance between contrast and resolution. The big news involves bigger pictures. With Angénieux’s IRO (Interchangeable Rear Optics) technology, the Optimo Ultra covers many formats: Full Frame/VV, Ultra35 (Super35Plus) and Super35. Versatility is achieved by swapping the rear group and lens barrels of the base lens, which is the Angénieux Optimo Ultra 12x 24-290. It is configured for S35 format out of the box. Also in the box is the U35 (S35+) rear group with dedicated focus, iris and zoom barrels. The FF / VV rear group and lens barrels are purchased as an additional extra. But, with new FF cameras here now or coming soon, skipping this option would be like racing a Formula 1 car with Go-Kart tires. Changing formats is as simple as unscrewing the rear assembly, swapping the focus, iris and zoom rings, and attaching the new rear group. It is a quick and easy task for rental houses and service facilities. Rings and rear groups are calibrated and optimized for each specific lens, with the same serial number on each component. In this way, focus marks remain consistent and re-shimming should not be necessary. See FDTimes PDF for details. 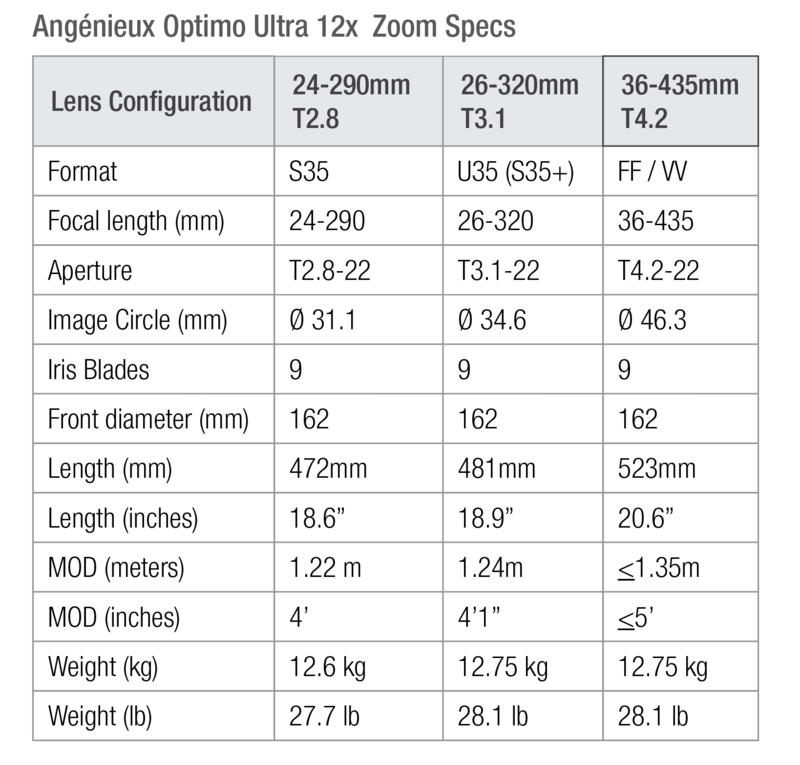 How does the new Optimo Ultra 12x in its basic S35 configuration compare with the venerable Angénieux 24-290? The Optimo Ultra covers a larger image circle: 31.1 vs 30 mm. Maximum aperture is the same, T2.8—as is the 162mm front diameter and close focus of 4 feet. At 472mm long, the Ultra 12x is only 32mm (1.3″) longer than its predecessor. The ingenious format flexibility of the Optimo Ultra offers rental houses and owners a wide choice of formats, focal lengths and apertures in one lens with three sets of rear groups and barrels. See Optimo Ultra 12x on the Angenieux website. for Sony’s new Full Frame camera, RED 8K VV, Panavision Millenium DXL (8K VV), ARRI Alexa 65 cropped to FF. In a way, the Optimo Ultra 2x FF paves the way for Sony’s new FF camera…by offering a really good studio zoom lens for it. Serial numbers must match to ensure consistent calibration and focus mark accuracy.